The second largest state in the USA, Texas is a mecca for all things food, arts, music and adventure. 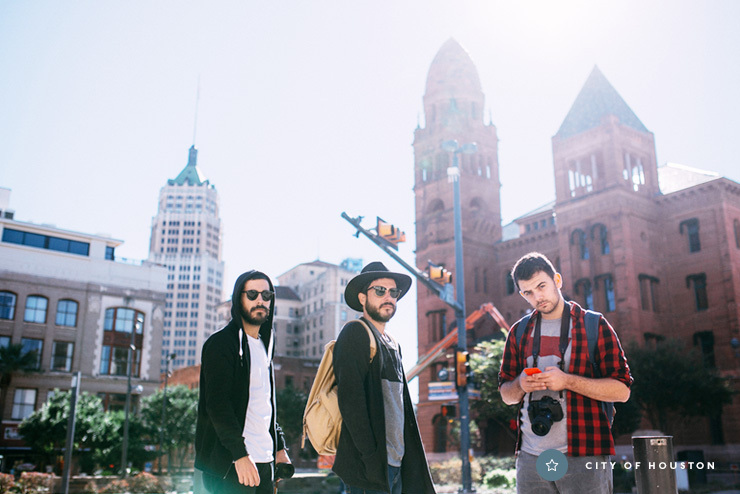 From the arty roots of Dallas and the Spanish influence of San Antonio, to Houston’s world-class dining and the rich entertainment and culture of Austin, there’s something for everyone in this lone star state. To help you get there fast, we’ve partnered with the American Express Explorer Credit Card. Perfect for avid travellers, with the Explorer Credit Card new members can take advantage of 50,000 bonus Membership Rewards points when they apply online and spend $1,500 in the first three months of the card approval date, as well as a $400 travel credit and two Sydney International Airport lounge entries per year. Now that’s how you travel in style! 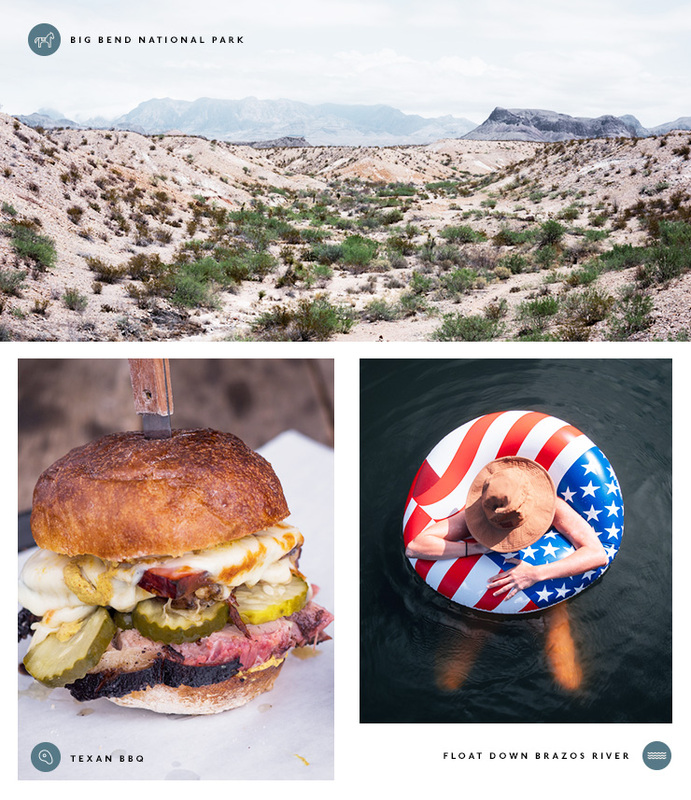 Now, without further ado, here’s the first-timer’s guide to Texas. BBQ as far as the eye can see, juicy steaks and burgers galore, Texas is one of the best places in the world to get your meat sweats on. But it’s not all about the meat here, Texas is also home to delicious, fresh seafood and Spanish-influenced cuisine (hello, Tex-Mex was born here!) You certainly won’t go hungry! Possibly one of the coolest places you’ll ever visit, Marfa is the arty capitol of Texas. A five and a half hour drive from San Antonio you must check out El Cosmico (a nomadic hotel and campground decked out with teepees, vintage trailers and Mongolian yurt tents), peer into Prada Marfa, peruse the bounded treasures at the Marfa Book Company, shop ‘til you drop at Freda and meander around the Chianti Foundation. It’s safe to say you’ll never want to leave. America has no shortage of incredible natural wonders and Big Bend National Park in Texas is no exception. You can hike or cycle your way through Big Bend, but we think doing it on horseback is best—when in Texas, right?! There are loads of tours available, take a look and book one of these. Spend a day strolling along the River Walk in San Antonio. The urban waterway rich in Spanish culture is home to loads of restaurants, bars, cafes, history and amazing things to do. Kick off by wandering through Museum Reach and if you find your legs are already weary from adventuring you can hop on a river boat. Stop by The Witte, The Doseum and the San Antonio Museum of Art then make your way downtown for a feed before entering Mission Reach for a big hit of history and culture. Austin is home to some freakin’ awesome craft breweries so you’ll want to stop by a couple at the very least. Check out Hops & Grain, Spoetzl Brewery, Real Ale Brewing Co and Brash Brewing Company. From the stunning Texas State Capitol building and the Fort Worth Stock Yards to the historic Alamo and The Sixth Floor Museum where the JFK shooter took his final blow, there’s no shortage of history in this southern American state. Boots were made for walking around Texas and you’ll definitely want to get yourself a pair while you’re here. Stop by Cobra Rock while you’re in Marfa and fork out over half a grand for some of their stylish leather boots or go cowboy style and head to Texas Traditions in Austin for a pair of their handmade beu-oot-ies. Pull on your recently acquired cowboy boots and head out to the rodeo for a night of whip-cracking, thigh-slapping fun. There are loads of rodeos in this fine state, but the Fort Worth Stock Show & Rodeo and the San Antonio Rodeo are two of the best. The cherry blossoms of Texas, take a drive out to Fredericksburg in spring to gaze at the rolling hills filled with bluebonnets. Grab a bottle or two of vino from one of the nearby vineyards and picnic among the blooms. Blow up an inner tube, find a nearby river and cool down the best way the Texans know how. There is an entire website dedicated to tubing in Texas, but some of the best rivers to float on include the Brazos, San Marcos and the Frio. Texas is massive so definitely hire a car and prepare to go on a bit of a road trip. Whatever you decide, there’s no shortage of places to stay and American Express make booking easy—click here to see how! Housed in a renovated 1920s neo-Gothic building in the heart of Dallas, The Joule serves up dramatic art installations, uber cool rooms decked out with the most stylish furniture and a top notch spa. Take a walk on the fancy side of life and blow your hotel budget on a stay at The Ritz in Dallas. It’s got luxurious rooms, great views and all the amenities you could ever need (including a rooftop pool). Austin’s Hotel Van Zandt has spared no expense fitting out their rooms. One of the best boutique hotels in Texas, the Van Zandt celebrates all things music and offers incredible views of Lady Bird Lake. Right on the banks of the River Walk, expect loads of Spanish and European influence at Omni La Mansion del Rio. Offering concept suites in the heart of the museum district in Houston, Hotel ZaZa is unlike any other. We’d quite like to stay in the Houston, We Have A Problem suite and pay tribute to astronauts past and present. This San Antonio restaurant by chef Steve McHugh offers one of the most comprehensive ranges of charcuterie and pickled food we’ve ever seen. Your tastebuds will be very impressed. Expect delicious farm-to-table eats at this winning Austin restaurant, plus craft cocktails, winning wines and draft beers. An award-winning restaurant in Houston, Underbelly celebrates the diverse cultures of Houston. The menu changes daily but you can be fairly certain you’ll be treated to loads of meat and seafood. Head to Joe T’s for some of the tastiest Tex-Mex you’ll ever devour. This joint has been around since 1935, so the team here knows a thing or two about this scrummy cuisine. It wouldn’t be a trip to Texas without shoving a whole lot of barbecued meats down your gob. If you’re after some of the best, head to La Barbecue in Austin. Forget McDonalds and stop by Whataburger for a fast food fix while you’re in the big T.
Getting to America from the land down under requires a day’s worth of plane travel, but you gain time going there so you can afford to spend a day resting up and adjusting to the time zone before launching into full on exploration mode. We definitely recommend using those points to upgrade to make the trip a little less painful, though! Texas is the second largest state in the United States so the weather can vary depending on where you are staying. You can experience hot and dry weather in the west, cold and dry in the north and sub tropical conditions through the middle of the state. 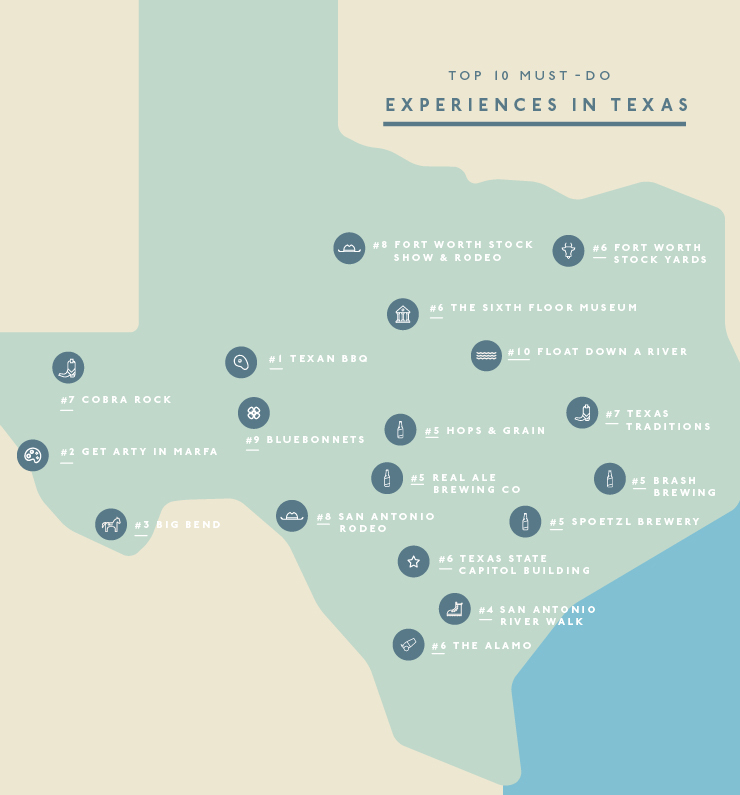 Texas is a great place to visit year round but is definitely busier and more expensive in the summer. September through October and March through May offer pleasant temperatures, cheaper lodging and less tourists. The currency in Texas is the US dollar. While English is the language spoken in United States, there’s a whole dictionary full of Texan slang. Many Texans don’t believe in putting sauce on their barbecue meats. Crazy! We’ve already mentioned that Texas is massive and unless you plan on being at the airport every other day, it’s best explored on road. If you're an American Express Explorer Credit Card holder you could spend your $400 travel credit on car hire, winning! Editor's note: This article is proudly sponsored by American Express and endorsed by The Urban List. Terms and conditions apply, click here for more information. Thank you for supporting the sponsors who make The Urban List possible. Click here for more information on our editorial policy.